50 shades of… yeah, not going there. Working around all of that, I started a quilt. I thought I’d have more time- the baby is not due until later March- but it turns out that the shower is this weekend- so I sprang into action! 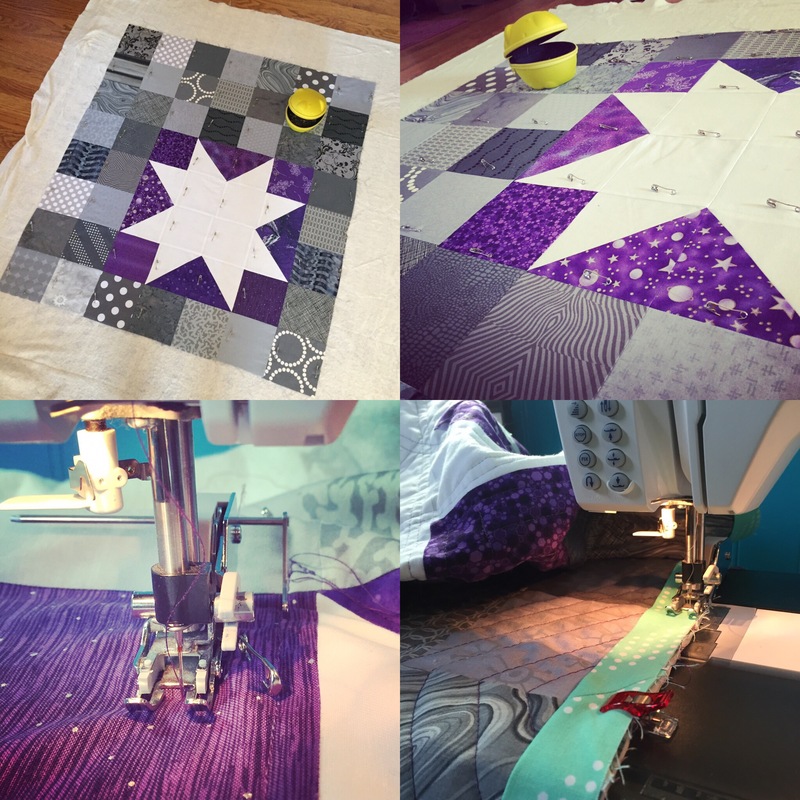 Fortunately, I had a plan in mind all along- Star Bright by Swim Bike Quilt. The baby is a girl, and the mom and I share a love of a particular color scheme. I had a false start- my original batch of greys was way too brown. So I replaced some and was much much happier! Honestly, the trickiest part of this one is truly picking the fabrics… Also really neat about these greys- some from my scrap bin go back a decade or more, and some are brand spanking new. I love that! The three-day weekend meant that I had enough time to baste and quilt this sucker- using my brand new quilt bar. I wish the arm(?) came further forward to line up with the walking foot, but, it was still a help. Meanwhile, I thought you might like to see all my helpers. 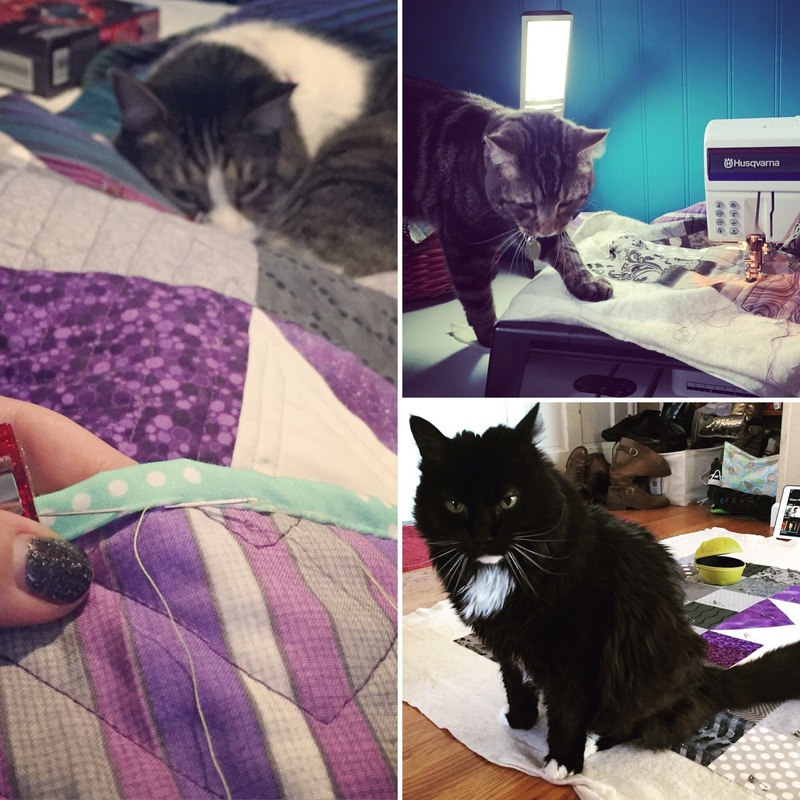 George (top right) is the newest member of the family (adopted 12/18/15) and as such, hasn’t yet learned not to climb on the sewing machine table. He was deeply offended that I wasn’t petting him at that moment. Wally, bottom right, at least had the decency to wait until I finished basting before he sat on the quilt. And Bob, normally the worst behaved of the lot, actually was happy to snuggle on my feet while I hand bound the quilt. Even with all this help, I still managed to almost finish the quilt last night. A teensy bit more hand sewing and then burying a few quilting thread ends, and it will be good to go! Whee! Then back to the Tardis quilt- which has actually been started! Annie and I are still in the cutting tiny squares phase, but now that the design wall is free again, we can start laying it out. 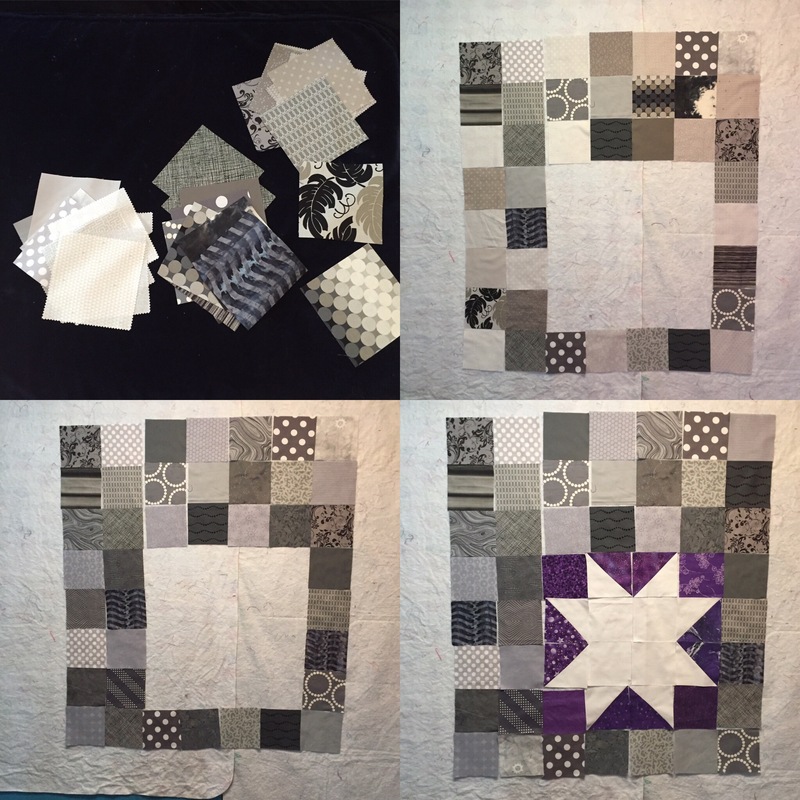 Linking up with Sew Cute Tuesday, WIP Wednesday and Let’s Bee Social. My excuse for totally falling apart at the end of the year is a sad quilt story that eventually had a miraculous ending. I made a lovely quilt, using some of my beloved Tula Pink Elizabeth, for a new baby in the family. Not a relative we’re close to, but still. Babies get quilts, right? And I FINALLY got it quilted and in the mail in early November. And so I asked my MIL to discreetly check in with the recipient, as she was seeing them over Thanksgiving. And the unthinkable had happened. The package had not arrived. And here is the part where you learn from my mistakes. Though, really, you would never have done what I did. You’re smarter than that. 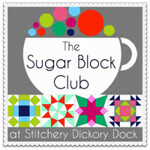 I shipped the quilt via the US Postal Service, priority mail. And I didn’t insure it- because a handmade quilt is priceless and how would I prove the value anyway? And I also didn’t bother with a tracking number, because the postal service has never ever lost one of my quilts before. Cue me banging my head against the wall and sobbing. Shaking my fist at the sky and muttering curse words. I contacted the postal service. First time filling out multiple pages of forms on their website, it crashed at the end and didn’t register my inquiry. 2nd time I made it through, and was rewarded with a form response saying they’d get back to me. A few days later I got a different form email that told me my problem had been forwarded to the appropriate department. 2 weeks later I got an email survey asking me to give feedback on the service I received. You can imagine how I filled that out! And that was the last I heard from the postal service. I was so down, and I didn’t want to admit this had happened. I didn’t want to blog about it- both because I was in denial, and because I didn’t want you all to know how dumb I am. And then- a miracle occurred. I mailed the package to our relatives at 123 XYZ St in CAMBRIDGE, MA. A rug cleaning shop at 123 XYZ St in WATERTOWN, MA received the quilt. But here’s the miraculous part- my relatives have used the rug shop before. And the shop owners recognized their name and address. And the quilt made it to the family. Anyway! 2015 taught me a very very valuable lesson. I’ll be shipping all quilts via UPS, not the postal service, from now on. If for no other reason than their customer service is more responsive. And, maybe, just maybe, I’ll also hold out hope when the odds seem stacked against me! Here’s hoping you had your own (major or minor) miracles in 2015- and the 2016 is even better!